Glass Blowers use 100% lead-free glass from recycled soda bottles. Although the glassware is very similar in height and width, No two pieces ever look identical, which adds to the appeal and uniqueness of our traditional hand blown glass from Mexico. Our glassware is dishwasher safe, just allow a short cooling off period before using them if the heat/dry cycle was used. 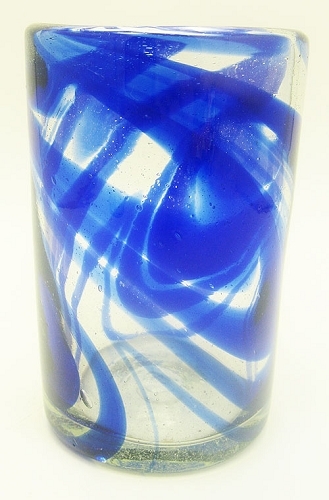 Each glass is truly a piece of art and durable enough for everyday use! Magellan Traders authentic hand blown glassware is not tempered. Each glass has tiny air bubbles blown within the glass that when exposed to extreme temperature changes can expand and cause the glass to crack, such as boiling liquid, or ice cold liquid poured into a warm or hot glass, so some extra care is necessary. Don't be fooled by the imitation glass from overseas factories that looks hand blown but is not. This imitation glass is machine made, very thin, and nowhere near the quality of authentic Hand Blown Mexican Glass. Open Monday-Friday 8am-5pm Mountain Time. Or Contact Us, we answer emails 7 days a week.